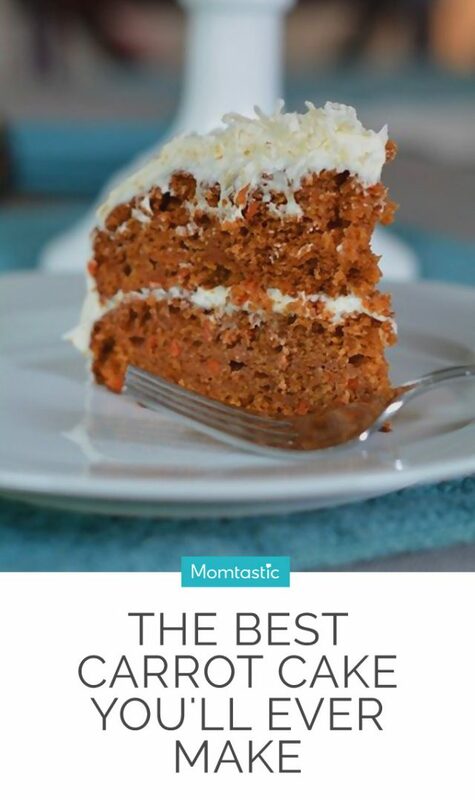 My grandmother made the best carrot cake with cream cheese frosting of all time. I have so many fond memories of licking my plate clean after each slice so as not to miss a single luscious crumb. 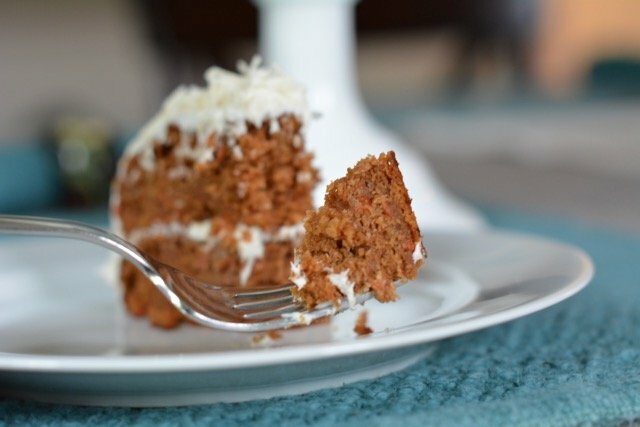 When I made her carrot cake recipe for my kids several years ago I couldn’t figure out why it didn’t taste the same as I remembered, until my mother pointed out the my grandmother used to double the frosting recipe. The cake I adored had a layer of cream cheese frosting nearly as thick as the cake itself. No wonder I loved it so much! 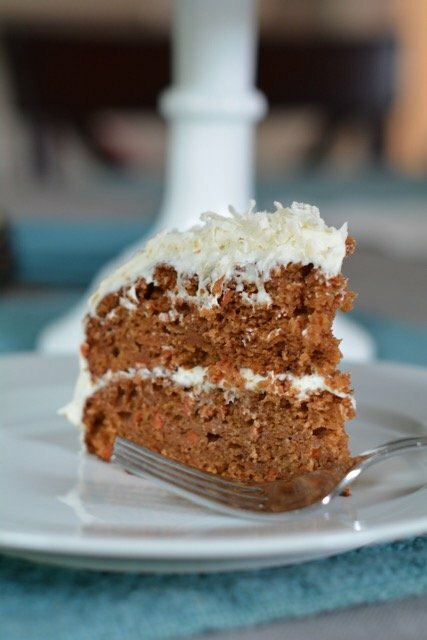 These days I’ve dialed down the cream cheese frosting and dialed up the carrot cake, but it’s still amazing nonetheless. I also eliminated the nuts because nobody in my house likes them in baked goods. Plus, some of my kids’ friends have nut allergies. I like to focus on flavor when I’m eating it and not the texture, but feel free to add them if you want to. 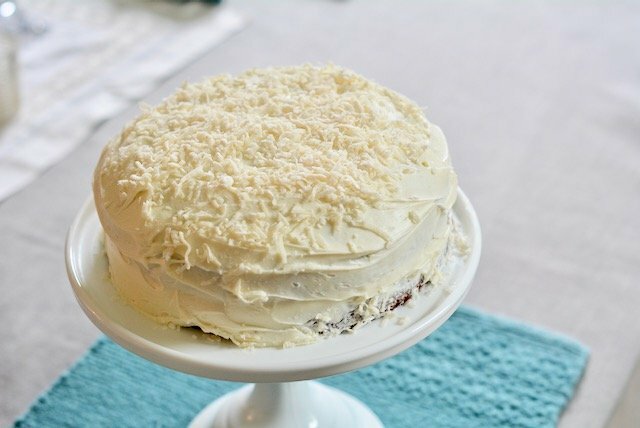 It’s easy to bake, easy to frost, and is coated with shredded coconut to cover any imperfections. 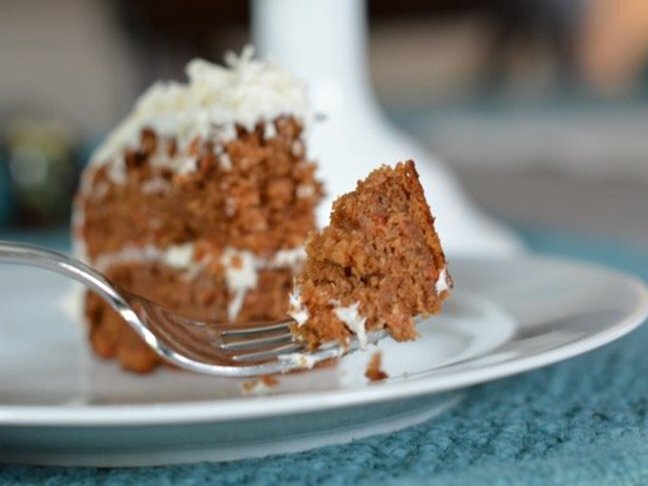 This moist, flavorful carrot cake will make guests swoon. Just make sure you have enough on hand for when they inevitably ask for seconds (or thirds!). Step 1: Preheat the oven to 350 degrees F. Butter and flour two 8-inch round baking pans and set aside. Step 2: In a large mixing bowl, beat the sugar, oil, eggs, and orange juice until smooth. In a small bowl, mix the flour, cinnamon, soda, and salt until combined. With the mixer on low, add the dry ingredients to the wet ingredients until smooth. Then, use a spatula to fold in the raisins and grated carrots until evenly combined. Step 3: Divide the batter evenly amongst the baking pans and bake for 28 to 30 minutes, or until the top is set and a toothpick inserted into the center comes out clean. Invert onto a wire rack to cool completely. Step 4: While the cake is cooling, make the frosting: In the bowl of stand mixer beat together the cream cheese and butter until light and fluffy. Then, add the vanilla extract, sugar, and salt. Mix well. With the mixer on low, beat the cream cheese mixture until completely combined. Step 5: Once the cake is cool, frost it well. Place one cake layer on a large plate and cover the top with about one-third of the frosting. Invert the second layer on top of the frosted bottom layer so that the flat side (the bottom) is on top. Spread the remaining frosting on the sides and top of the cake. Sprinkle the coconut on top and enjoy! Like what you see? Don't forget to Pin it!